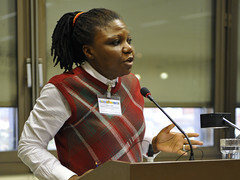 Alache Ode, Chairperson of the Board of the African Foundation for Development (AFFORD) and manager of the Diaspora Volunteering Initative of the Voluntary Service Overseas (VSO), focused her presentation on the Diaspora contribution to rural and business development. Diaspora is a very contested concept, which is constantly evolving. Aspects of the working definition include de-territoriality, hybridism (link to home and host countries) and emotional, family or financial links to the home country. Belonging to a Diaspora also depends on the self-definition of the migrant. Two views of Diaspora exist: Some attach rather negative connotations to Diaspora, victimizing them and attributing loss of origin and place to Diaspora. The view which is preferred by Ms. Ode is a more positive one. For her, Diaspora is associated with voluntary, young and spore. Diasporas can be valued as seeds providing new perspectives on our connected world. AFFORD case studies show the potential of Diaspora-led volunteering activities to transform rural communities through sustainable business development. Programmes included business training and mentoring of small businesses through volunteers, partnerships with universities, local and national governments departments, negotiation of new financial packages with banks for small businesses, support of cooperatives or establishment of business centres. All this resulted in remarkable job creation through micro and medium enterprises and entrepreneurs. As concluding remarks, Ms. Ode called for “the Diaspora option”, which means to develop concrete, realistic and practical policies that draw upon Diaspora, their knowledge, skills and financial resources to stimulate, harness and consolidate development.